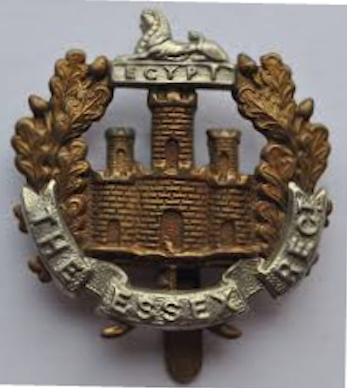 formerly 29131 Norfolk Regiment. Crois de Guerre. Nicholas Brightmer Gould was born in North Elmham, Norfolk on Wednesday 22 November 1893, the fourth child of James (1832-1897) and Sarah Elizabeth Gould (1854-1907) and was baptised at St Mary's Church in North Elmham on the February 4th 1894. Nicholas was James’s thirteenth child, who’s first wife Martha had died in 1887. James or ‘Harry’ as he seems to have been more commonly known had 9 children with Martha: Walter c1856-, Sarah Shirley 1859-18 Apr 1910, Catherine Rebecca 'Kate' 1862-Jul 1899, Herbert 1864-, Rosanna Martha 1865-, Minnie Jane 1866-, Annie Martha 1868-, Arthur James 1869-1871 and Edith 1871- and 5 full siblings Frederick 1890-1987, Arthur George 1892-, Florence Elizabeth 1892-, Henry Edward 1895-22 May 1980 and Alice M 1897-. In November 1896, aged 3 Nicholas was admitted to North Elmham School. GOULD FAMILY TREE.The earliest validated record of the Gould family found so far, is in the Baptism register for Bintry (Bintree) of 15 September 1799, when Nicholas' paternal Grandfather - James (son of Nicholas and Sarah Gould) was baptised. Nicholas' paternal Grandfather James married Charlotte Nobes at Wood Norton on 28 Oct 1826. Records from Bintree also provide us with the baptism dates for James and Charlotte Gould's children: Son James 3 February 1832. Daughter Elizabeth 8 March 1835. Daughter Emily 15 January 1837. The 1841 census is the first modern UK census to record the details of every person and household in Britain, and the earliest census that has survived in its entirety. The census for Bintree taken on the 7 June reveals James Gould Snr (45) and wife Charlotte (40) have 7 children - six girls and 1 boy - Sofa (16), Mary (12), Sarah (10), James Jnr (8), Elizabeth (6), Emily (Emilia) (4) and Susan (2). Ten years on and the 1851 Census for Bintry James Gould Head aged 54 Carpenter born Bintry, wife Charlotte 52 born Wood Norton and five of their children who were all born in Bintry James 18 Carpenter, Elizabeth 16, Emily 14, Susan 11 and William 8. James ‘Harry’ and Martha Shirley were married at Bintree in August 1856. Five years later according to the 1861 Census James 'Harry' Gould Jnr a journeyman carpenter and Martha are living on what the recorder describes as Dereham & Holt Road, North Elmham with their first two children who had both been born in Worthing Norfolk. James gives his age as the same as Martha who is 28 and was born in Hindolvestone about 1832. Son Walter (4) was born about 1856 and sister Sarah (2) born about 1859. On Elmham Road in Bintree, James Gould Snr (61) a Master Carpenter and wife Charlotte 61 are living with 24-year-old daughter Emily who is a schoolmistress and granddaughter Sarah Mayhill aged 6. By the time of the 1871 Census James 'Harry' Gould Jnr and Martha are living on what was then known as the Dereham Road, North Elmham with their six children. James is a carpenter and again gives his age as the same as Martha who is now 39. Eldest son Walter 14 is a gardeners assistant, Sarah (12), Katherine (8), Herbert (7) Anne (3) and Arthur James (1). Katherine, Herbert, Anne and Arthur were all born in North Elmham. 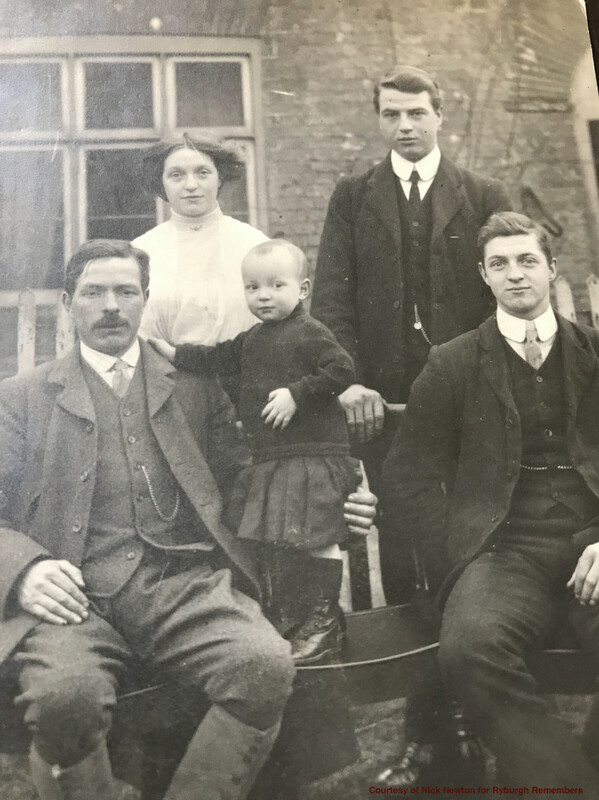 Another ten years on and the 1881 Census records James 'Harry' Gould Jnr and Martha (49) are living with five of their children in North Elmham. Forty-seven-year old James gives his occupation now as master carpenter. Eldest unmarried daughters are Sarah Shirley (Shirly) a 22-year-old dressmaker and Kate who is 18. Son Herbert is a 17-year-old apprentice carpenter. The two youngest children daughters Anna M (13) and Edith (9 born North Elmham) are both at school. Martha died on April 2nd 1887 aged 55 years and was buried in the churchyard at St Mary's. Her headstone reads - In memorium Martha dearly loved wife of James Gould The Lord gave and the Lord hath taken away. In the second quarter of 1889, James 'Harry' married Sarah Elizabeth Clarke in Norwich. According to the Register of Baptisms solemnized in the parish of St Etheldred in the County of Norwich, Sarah was born on 7 September and baptised the following month on 15 October 1854 in Norwich to her parents James Brightmer and Lucretia Clarke. Thanks to the diligence of the curate, we are also able to confirm that James Clarke's trade was a grocer and Lucretia's maiden name was Plunkett. The Clarke's were a Brisley farming family, with Sarah's Grandfather Brightmer a farmer of 33 acres at the time of the 1861 census. The 1891 Census for Chapel Road North Elmham confirms that James 'Harry' Gould aged 57 as the Head of the family has re-married and is employed as a carpenter on the estate. With her husband James is 37-year-old Sarah Elizabeth. Living with them, from James' marriage to Martha are a son - Herbert a 27-year-old Carpenter and two daughters Anna M (23) and Edith (19) who are both dressmakers. The newest addition to the family is 1-year-old Frederick the first of six children to James and Sarah. Meanwhile, in the City of London at 47 Threadneedle Street we find Sarah Shirley Gould now aged 32 and employed as a ladies maid (domestic) visiting her sister Kate and her husband Henry Edward Calver Goshawk the Resident Messenger at the National Bank of India. 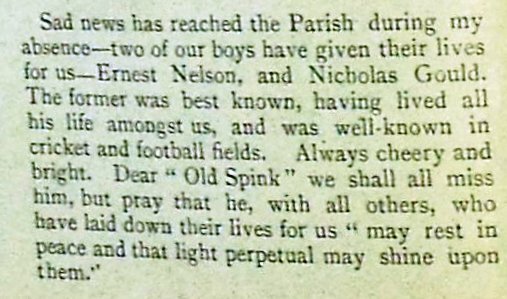 Via the British Newspaper Archive, we discovered that Nicholas' father James 'Harry' died suddenly on 21 December 1897. The Norfolk Chronicle and Norwich Gazette reported James's death in its Christmas Day issue. James was buried at St Mary's on Christmas Eve. Sarah Elizabeth Gould, head, widow aged 46 born Norwich. Frederick Gould, son, 10, born North Elmham. Florence E Gould, daughter, 9, born North Elmham. Arthur George Gould, son, 8, born North Elmham. Nicholas B Gould, son, 7, born North Elmham. Henry E Gould, son, 6, born North Elmham. Alice M(aud?) Gould, daughter, 4, born North Elmham. Back L-R is sister Florence Elizabeth Dawson and Nicholas. Front L-R brother-in-law William Dawson, nephew Cecil Walter Dawson and bother Henry(Harry) Edward Gould. In May 1907, when Nicholas was 13, his mother Sarah died and it is presumed that Nicholas went to live with his maternal Grandmother Lucretia. It is not until the Census of 2 Apr 1911 do we have confirmation that Nicholas, now 17, was living with and working for 78-year-old Lucretia Clarke at Heath Road Elmham. Lucretia was by now a widow who gave her occupation as Farmer (Own account). At the same address was Lucretia's 43-year-old son Brightmer Clarke (Farmer (Own account)), hiswife Laura Elizabeth Clarke 40 and their 3 month old daughter Mary Lucretia Clarke. Elsewhere in North Elmham, lodging with Albert King's family in The Heath, is 20-year-old Frederick James Gould who gives his trade as Carpenter and in Chapel Street younger brother Henry Edward now aged 16 is a Grocer's Assistant andboarding with Mr Robert Kerrison who was a Grocer, Draper and Postmaster and his wife Jane Kerrison (born Great Ryburgh) at North Elmham Post Office; a building still in use as a Post Office today. Also, at The Vicarage is 14-year-old sister Alice who is employed as a Domestic Servant to Ernest Horace Townsend a Clerk in Holy Orders. At 2 Cordoba Cottages, Staithe, Stalham an 18-year-old Grocer's Assistant Arthur Gould is boarding with Maria Shreeve. 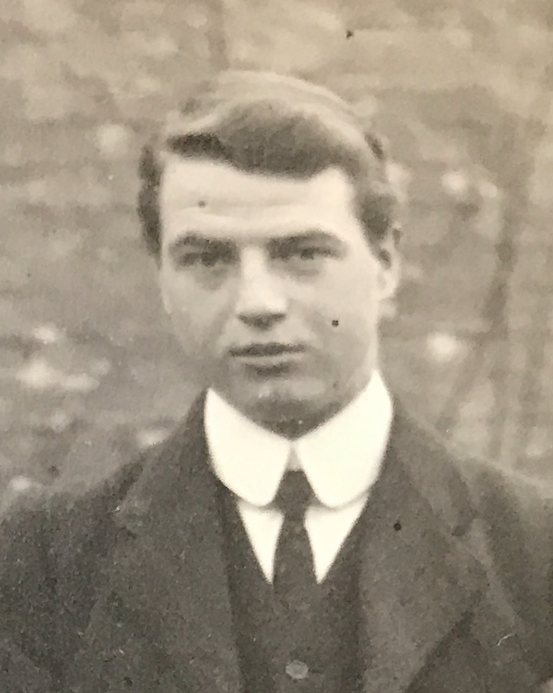 Between the 1911 Census and the start of The Great War, Nicholas moved to Great Ryburgh and research continues into that particular period of his life. 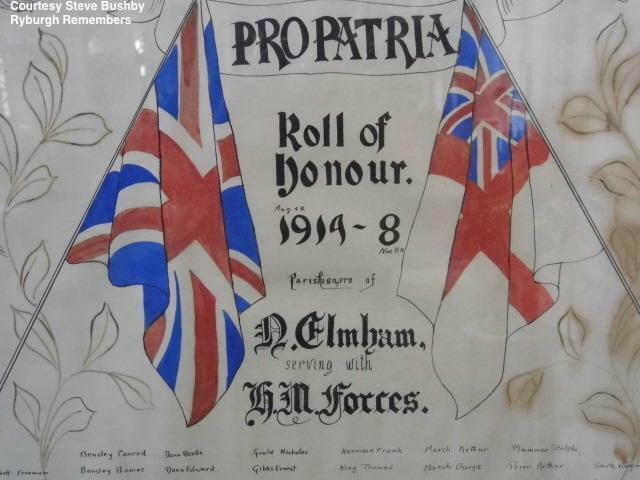 Initially, Nicholas enlisted in Norwich becoming 29131 Private N Gould Norfolk Regiment. Nicholas along with many others from the Norfolk’s transferred to the Essex Regiment and was given a new service number – 41397. Sadly, Nicholas’s service record is not available, presumably destroyed with many others during WW2. Whilst we’ve not yetbeen able to identify specific elements of Nicholas’s military service, we do know that the earliest he could’ve entered a theatre of war would’ve been after 1 January 1916 as he was not awarded either the 1914 (Mons) or 1914/15 Stars. We do know that on 27 August 1918 – the day Nicholas was killed, that as part of the 53rd Division, he would’ve been one of the 10th Essex and the 8th Berkshires who fought all day on 27 August 1918 to recapture Trones Wood after some intense fighting. As is often the case, there is not any personal information about Nicholas on the day that he was killed. However, there are three published sources that when combined do help to create a picture of the military events of that fateful day. 2/Lt G LORD Suffolk Regt 2/Lt G HOLT & 2 Lt D MILNE (Hunts Cyclists) report for duty. position about S.22.A&C to counter attack if required. Batt HQ at S.27.a.3.8. 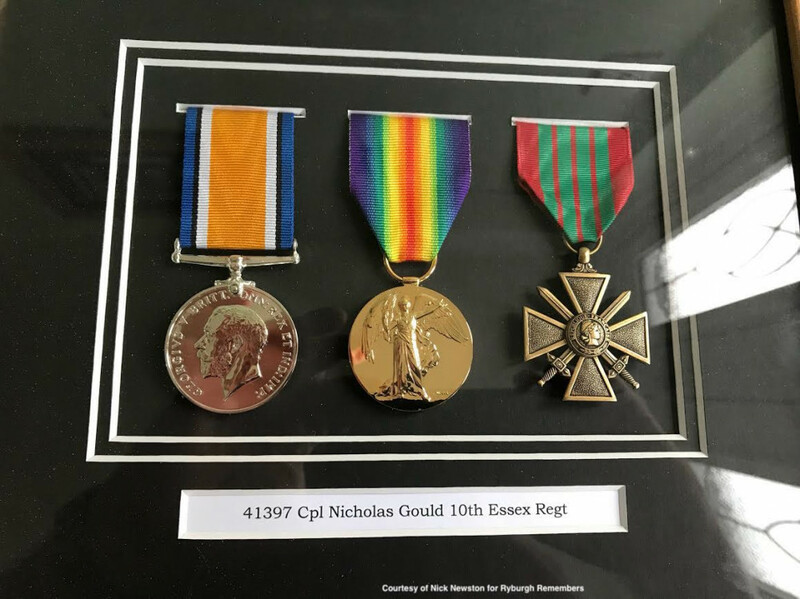 The Essex Regiment Service Medal and Award Roll confirms that 41397 Cpl Gould was entitled to the Victory Medal and British War Medal and had also been awarded the Croix De Guerre. 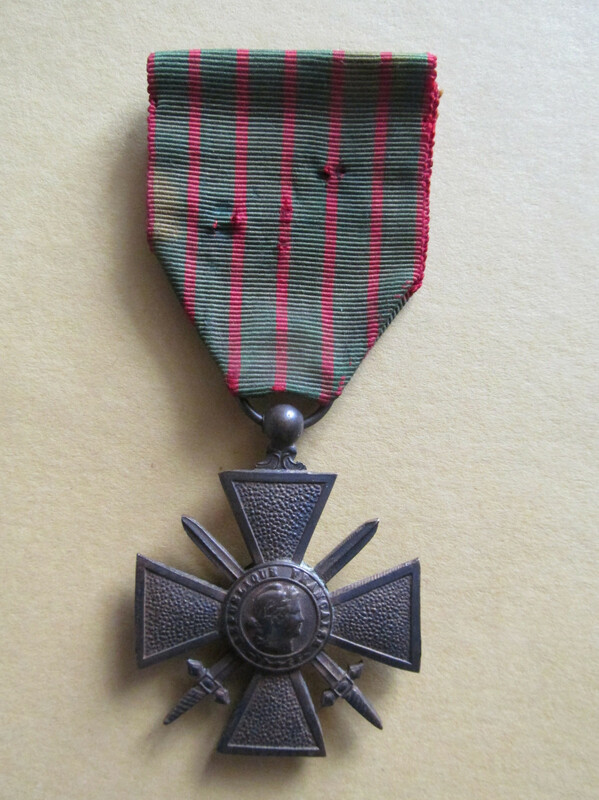 The French Croix De Guerre had been instituted by its Government in 1915 to recognise acts of bravery in the face of the enemy, although at this stage, it is not clear as to the specific reason why Nicholas received this award. Presumably, whilst a Lance Corporal, Nicholas had been mentioned in despatches - time and further research will hopefully tell us the answer. The award of the Croix De Guerre was also published in the Third Supplement to The London Gazette of 8 October 1918 on 10 October 1918 as follows: "The following are among the Decorations and medals awarded by the Allied Powers at various dates to the British Forces for distinguished services rendered during the course of the campaign:- His Majesty the King has given unrestricted permission in all cases to wear the Decorations and medals in question. Decorations conferred by THE PRESIDENT OF THE FRENCH REPUBLIC Croix de Guerre. "41397 Lance-Corporal Nicholas Gould,Essex Regiment (West Wickham)." The following day, the Essex Chronicle also reported Nicholas’s award. Nicholas Gould's replica set of medals, the originals being in the hands of a private collector. The UK Army Registers of Soldiers' Effects reveals that £14-7/- 5d. back pay was authorised to Sole Legatee Lily Canham on 23 January 19 and the War Gratuity payment of £14-10/- followed on 18 November 1919. The term legatee is often used to designate a person who takes anything pursuant (according) to the terms of a will, so it would be reasonable to assume that Nicholas left a will. 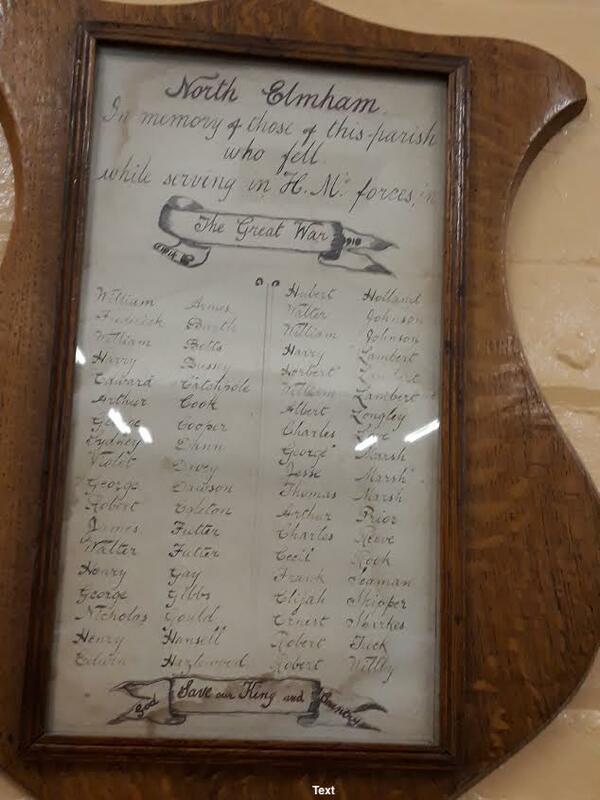 Perhaps the Lily referred to on the Register of Soldiers' Effects is the daughter of Farm Labourer William and his wife Ellen Canham who lived in Westwood Lane at the time of the 1911 census. Lily who was a Grocer and Drapers shop assistant, would have been a similar age to Nicholas, having been born about 1894 in Beetley. Lily Canham went on to marry Samuel John Shaw from Loughborough on July 30th 1921. 1. 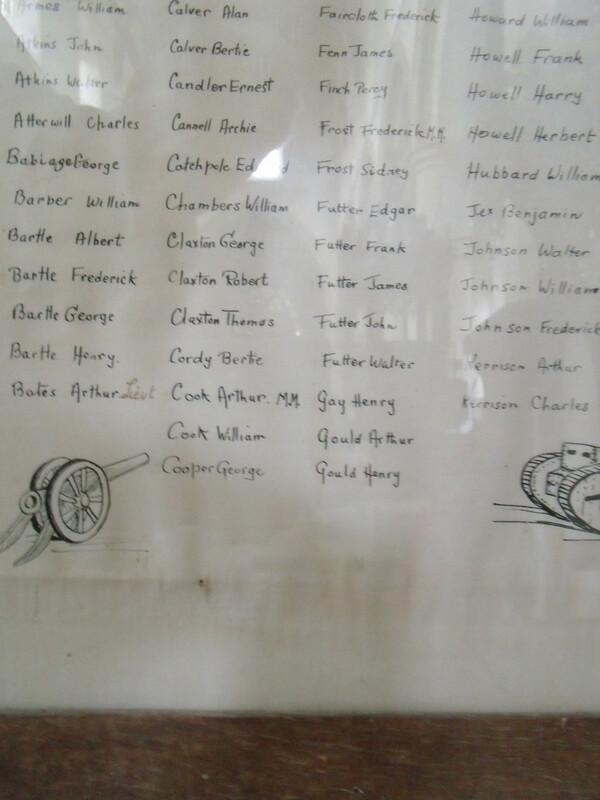 Roll of Honour St Andrew's Church Great Ryburgh.Recorded in the middle column of the Roll of Honour in St Andrew's Church amongst the “illuminated” list of all those 131 names “from the Parishes of Gt. 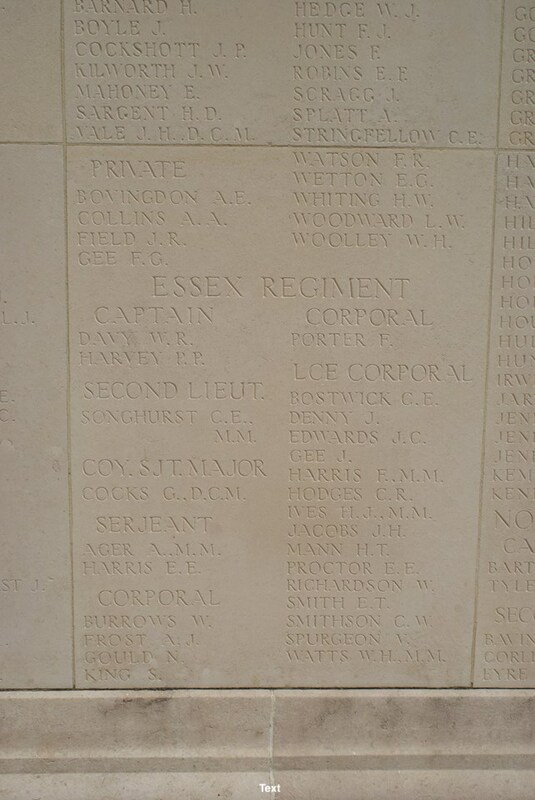 and Lt. Ryburgh and Testerton who served from 1914 - “(the closing date was never added) is +Gould Nicholas Norfolk Regt. 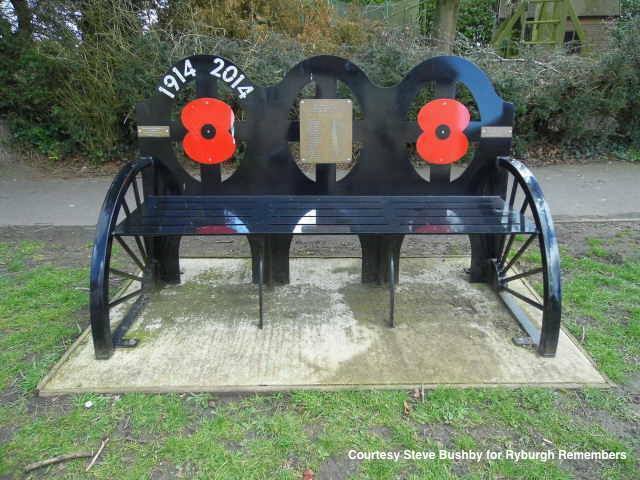 In the history of the Ryburgh War Memorials as seen in Revd. F.H. Tatham’s reports in the Ryburgh Parish Magazines there is a probable reference to Corporal Gould in January 1921, which helps to explain that whilst Nicholas' name appears on the Ryburgh Parish Roll of Honour, why he is not named on either the Parish War Memorial or above the stage in the Memorial Hall. can verify them and [make] sure no one is forgotten by examining the [list] in the Church. parish (Probably Nicholas Gould from North Elmham) and is commemorated in his [village]. light perpetual shine upon them". Visitors will find a brass plaque on the tower pillar dedicated 'To the Honoured Memory of those of this Parish who Fell in The Great War 1914-1919. Listed amongst those who were Killed In Action is Nicholas Gould. 3. Propatria - for one's country. 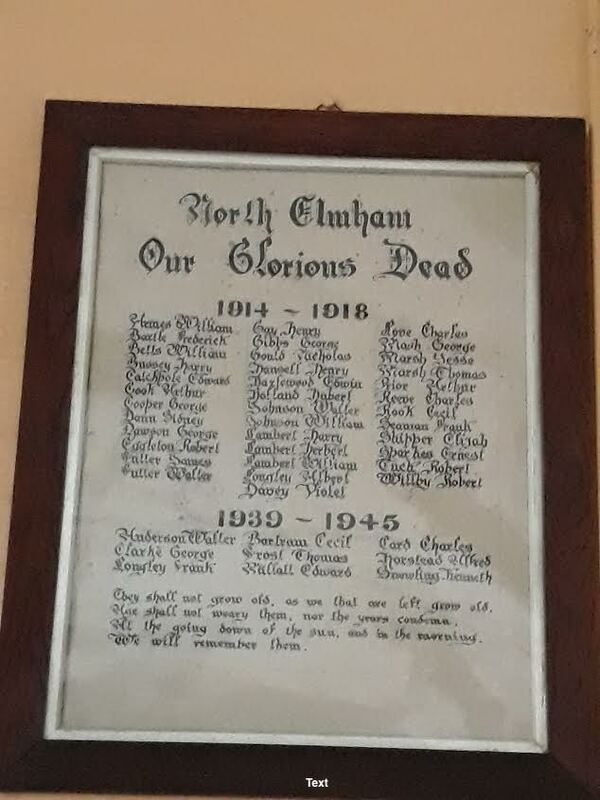 Also inside St Mary's Church North Elmham on display is the Roll of Honour 1914-8 Parishioners of N. Elmham who served with H.M. Forces. 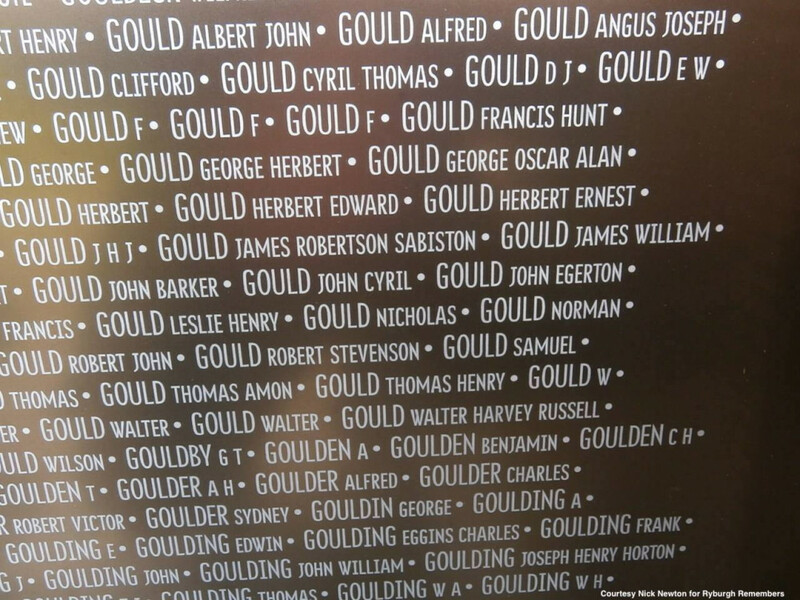 Nicholas is listed at the top of the 4th column, preceded by an Arthur (not known if related) and youngest brother Henry Gould who are the last two entries in the 3rd column. 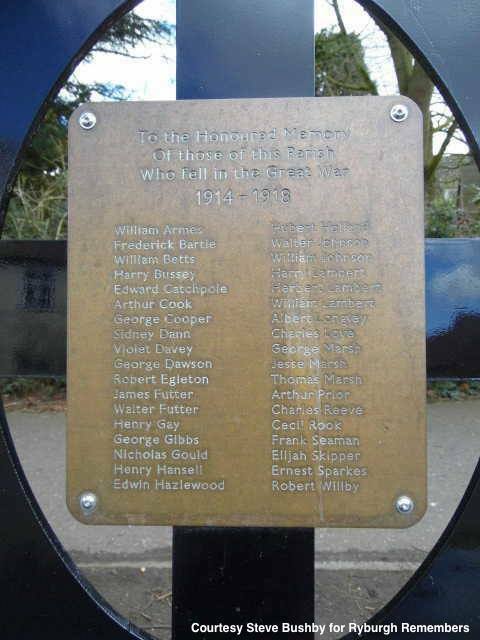 4.Found at the junction of Holt Road and Cathedral Drive, the WW1 Centenary Memorial Seat in North Elmham was erected in conjunction with the Royal British Legion and bears 36 names. 6. 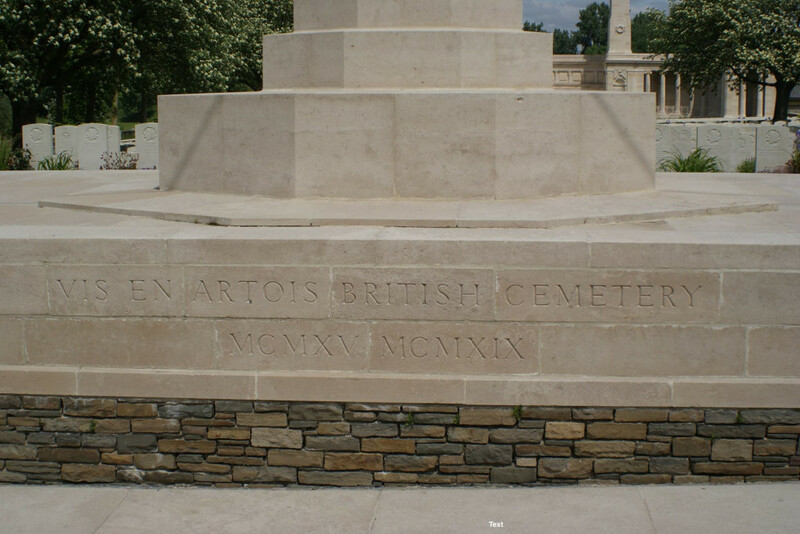 Commonwealth War Graves Commission Vis-En-Artois Memorial Panel 7 Pas De Calais France (S2). 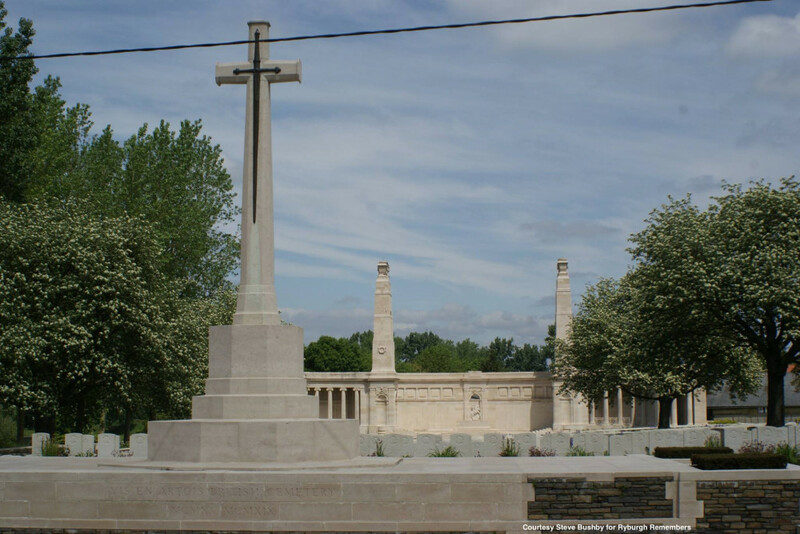 Nicholas Gould is one of over 9,000 men named upon this Memorial who fell in the period from 8 August 1918 to the date of the Armistice in the Advance to Victory in Picardy and Artois, between the Somme and Loos, and who have no known grave. They belonged to the forces of Great Britain and Ireland and South Africa; the Canadian, Australian and New Zealand forces being commemorated on other memorials to the missing. The Memorial consists of a screen wall in threeparts. The middle part of the screen wall is concave and carries stone panels on which names are carved. It is 26 feet high flanked by pylons 70 feet high. The Stoneof Remembrance stands exactly between the pylons and behind it, in the middle of the screen, is a group in relief representing St George and the Dragon. The flanking parts of the screen wall are also curved and carry stone panels carved with names. Each of them forms the back of a roofed colonnade; and at the far end of each is a small building. The memorial was designed by J.R. Truelove, with sculpture by Ernest Gillick. It was unveiled by the Rt. Hon. Thomas Shaw on 4 August 1930. 7. The Ring of Remembrance at the Notre Dame de Lorette Memorial. WALTER (Half brother) born about 1856 Worthing, Norfolk and baptised in Worthing on 16 Dec 1856. Apr-Jun 1878 married Cecilia Brunning in Norwich. At the time of the census taken on 3 Apr 1881, Walter (carpenter) and Cecilia were living at 7 Lower Drayton Road, Drayton with 3 children William (12 Aug 1877-21 Oct 1931), Laura Emma (1879-1904) and Walter George. Ten years later and the family had moved and grown. At 9 Garibaldi Terrace, Hellesdon with Walter and Cecilia are 5 of their 6 children - Laura Emma, Walter George, Herbert James (1881-DoW 10 Apr 1918), Harry and Cecil Frank. On 3 Oct 1900, Walter gave away his daughter Laura Emma when she married Ernest Bushell at St Matthew's Church, Thorpe. SARAH SHIRLEY(Half-sister) born about 1859 Worthing and baptised 30 Jun 1861 at St Mary's Church in North Elmham. Sarah was certainly living in North Elmham up to the 1881 census when she was aged 22 and a dressmaker. The next census of 5 Apr 1891 records Sarah visiting her sister Kate and her husband Henry Goshawk at 47 Threadneedle Street (National Bank Of India) - Sarah gives her occupation as a Ladies Maid (domestic). Jul-Sep 1894 married Herbert Langton in the registration district of Burton on Trent, Staffordshire. The 1896, 1900, 1904 and 1912 editions of Kelly's Directory list Herbert as a wheelwright, carpenter and builder. 31 Mar 1901 census aged 41 living with Herbert at Main Street, Whittington, Lichfield, Staffordshire. (S4) Sarah Shirley Langton, died 18 Apr 1910 aged 49, and was buried 21 Apr 1910 at St Giles Church, Whittington. 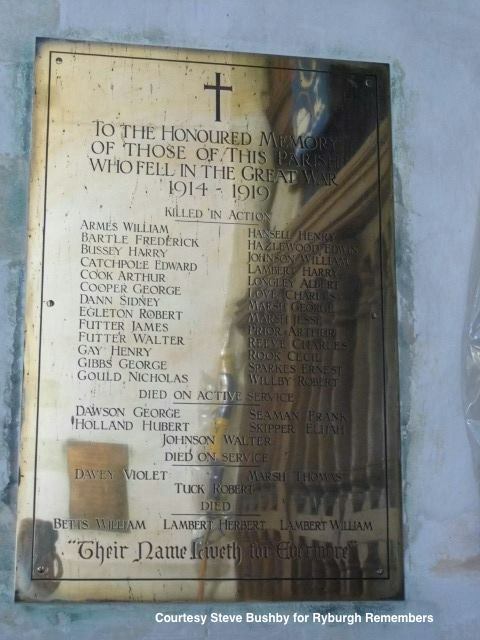 Her husband died 8 Oct 1914 and was also buried at St Giles Church, Whittington on 11 Oct 1914. CATHERINE REBECCA ‘KATE’ (Half-sister) born about 1862 North Elmham and baptised 30 Jun 1862 at St Mary's Church in North Elmham. Kate married Henry Edward Calver Goshawk at the Church of Saint Botolph-without-Bishopsgate in Sep 1889. Died about Jul 1899. HERBERT(Half-brother) born about 1864 North Elmham and baptised 5 Mar 1864 at St Mary's Church in North Elmham. Died aged 43 at Union House Gressenhall. Buried St Mary’s 15 Apr 1907. ROSANNA MARTHA (Half-sister) born about Feb 1865 North Elmham and baptised 1 March 1865 at St Mary’s. Buried St Mary’s 29 Aug 1865. MINNIE JANE (Half-sister) born about 1866 North Elmham and baptised 10 Jun 1866 at St Mary’s. Buried St Mary’s 5 Oct 1866. ANNIE MARTHA (Half-sister) born about 1868 North Elmham and baptised 6 Sep 1868 at St Mary’s. On 2 Sep 1900, Annie married her late sister Kate’s husband Henry Goshawk at St Andrew’s Church, Enfield. Initially, Henry of 47 Threadneedle Street and Annie of 31 Threadneedle Street tried to have their Banns read at St Helen’s Bishopsgate on 8 Aug, but the remarks column records ‘Illegal; deceased wife’s sister. Banns: not published’. At that time, marriage to a deceased wife’s sister and a deceased brother’s widow were illegal from 1835 until the Marriage (Prohibited Degrees of Relationship) Acts, 1907 and 1921. However, many couples and clergy chose to look the other way, as many of their parishoners had already married their sisters-in-law, under the belief that this was the best thing for any children. It would appear that the Vicar of St Andrew’s was one who overlooked the law and Henry and Annie’s Banns were published on 19, 26 Aug and 2 Sep. 31 Mar 1901 census living with Henry at 7 Llynne Terrace, Gordon Lane, Enfield. Annie died Jul-Sep 1901 aged 32. ARTHUR JAMES (Half-brother) born about Apr 1869 North Elmham and baptised 5 Sep 1869 at St Mary's. Died aged 2 and was buried on 30 Sep 1871 at St Mary’s. EDITH (Half-sister) probably born 29 Jul 1871 North Elmham, was baptised on 3 Sep 1871 at St Mary’s. On 4thAug 1894, Edith of 24 Borough High Street married 21-year-old George Henry Price at St Saviours Southwark, with her sister Annie attending as a witness. Henry like Edith’s brother-in-law Henry Goshawk was a Bank Messenger and lived at 31 Borough High Street. Henry and Edith went on to have 10 children of which 9 were alive at the time of the 1911 Census (Edith ‘Shirley’, Alice ‘Kate’, Elsie, Olive, Florence, Gladys, Victor George, Ruth and Gwendoline). It appears that Edith and Henry spent their lives in Enfield and at the start of WW2 were living at 48 Brigadier Avenue. Steve Bushby & Ryburgh Remembers are very grateful to Janet Woodhouse, North Elmham resident and historian, Lord Philip Wood, Sharon Moore and Nicholas’s Great Nephew, Nick Newton for their help in compiling this biography. Ryburgh Remembers 2016, 2017, 2018.